On that dark winter afternoon, Luana started to rise the sun in the minds of the people with E Ala E. She aks the audience to clap their hands together with her and they did quiet well. 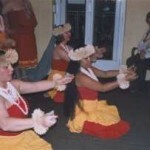 Then we dancers went in with Ku Ka Punoho. During the following first part of the performance we danced Huki Ike Kalo, Haaheo O Hana, Heia, Kawika and Papalina Lahilahi. 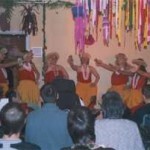 Some of the dancers had their first performance and they did very well. In between the dances Luana talked about their content and meaning. 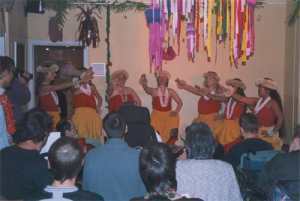 She let the people guess the gestures of Huki Ike Kalo, which was great fun for them. The audience payed great attention to the story of Haloa and laughed out loud when Launa came to the point in Heia, where Kalakaua felt from his surfboard into the ocean. They enjoyed all the stories arround the dances very much. Luana, Edna and Silke had to change their dresses for the last two dances. Since I’m not familiar with Aloha Kaua’i and I did not know their changes for Ho’ola Lahui Hawai‘i, I took over to talk to the people during that break. After I explained Papalina Lahilahi, I showed my Ipu to the people. I passed it on to the audience and they tried to drum it, while I talked about growing gourds in the garden. Afterwards they got the opportunity to see and play the Ili-Ili. The people enjoyed to feel and try the implements. I brought also my Ukulele in order to show it to the people and they got a sample of the instuments sound. 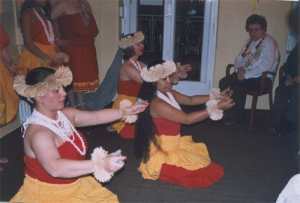 The performance ended with Luana, Edna and Silke dancing Aloha Kaua’i and Ho’ola Lahui Hawai’i. The audience was very interested and we received lots of questions. During the last years I participated several Hoikes and also small performances, but I never experienced such a great audience like these handicapped people. When I remember that afternoon I still see their shining eyes and their strong emotions. Thanks to Luana for inviting me to join the performance !